Wild Flamingo Pink Earrings. Superb shades of hot pinks and feminine peach tones too. 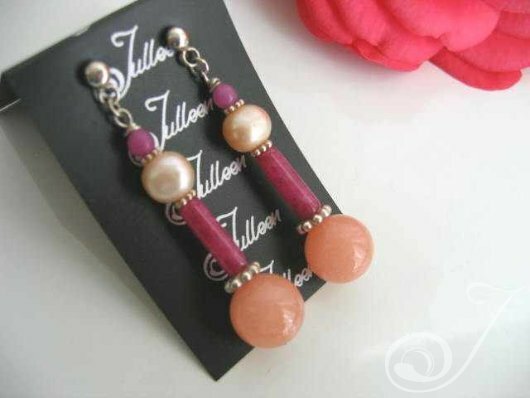 Hot Pink and Fuchsia Jade gemstones, with peach pearls and Salmon Jade. *12 mm Salmon Jade *4 mm Hot Pink Jade Beads with *8mm creamy peach pearls. Only high quality sterling silver used in all our items – Total Drop – 55 mm. Great for many colourings. Seen here on red auburn head. Stunning!